The IHRC is writing to express its deep concern over the use of body scanners at UK airports. 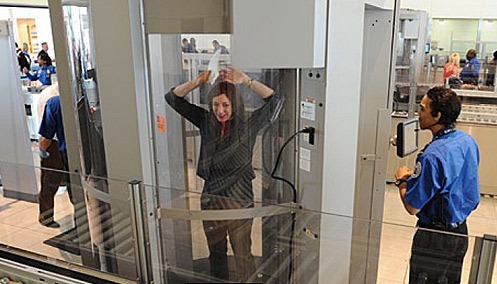 On 1st February 2010, the then British government introduced body scanners at Heathrow and Manchester airports. The body scanners produce detailed images of a person as if they were unclothed on a computer screen. – The use of the body scanners violates Article 8 of the European Convention on Human Rights- everyone has the right to respect for his private life. Numerous commentators have described the procedure as an electronic strip search. During the scan, images with intricate details of naked bodies, including the outlines of women’s breasts and the genitalia of both genders, will be seen on a monitor by another person who could be male or female, sitting in a different room. German Security advisor Hans-Detlef Dau, a representative for a company that sells the scanners, admits that the machines “show intimate piercings, catheters and the form of breasts and penises”. The IHRC believes that the right to privacy includes the right to decide who views your body, whether in person or via images. The fact that the screener is unable to identify the passenger does not change the fact that he or she is viewing a near naked image of the passenger. By forcing the passenger to go through the body scanner he/she is being stripped of his / her privacy; his/her right to decide who takes and views images of him/her. Most countries do not use scanners. This means that there are large numbers of passengers who are entering the UK who could pose a threat to the UK. Yet we are being scanned as we leave the UK. There is no security benefit to the UK as a terrorist may still attack the UK by boarding a plane in a country where security scanners are not used. – Due to the explicit nature of the pictures that the body scanners create, the IHRC believes that the government will be breaching section 1 of the Protection of Children Act 1978, namely the prohibition against the taking of indecent images of children. There have been independent reports that the body scanner machines do in fact have the capability to save, store or print images. During this year’s election campaign both the Conservative party and the Liberal Democrats discussed the issue of civil liberties. They correctly identified the massive encroachments in civil liberties under the previous government over the last decade and discussed how they would restore the freedoms Britain has always held sacred. These are commendable principles and it is pleasing to know that the new government is serious about civil liberties. If the Coalition government wants to govern by these principles it must abandon the previous government’s policy of destroying individual civil liberties and restore the rights of people to them. In light of the government’s support for civil liberties, the IHRC urges the government to stop the use of body scanners at airports. It was a hasty knee-jerk reaction by the previous government to a single event, a reaction that does not effectively tackle the issue of international aviation security and erodes our civil liberties.